2006 Honda pilot-still at the pinnacle of Honda's premier SUV performers. My 2006 Honda pilot is the best performing and most enjoyable car I have ever owned. After 156, 336 miles driven, it still performs like new. Approximately half of the years I have owned the car it has been garaged when inoperative and the other half it has been uncovered while inoperative. The car has been well maintained and very rarely needs service or parts beyond occasional changes to windshield wipers, a new battery, oil changes and tires. The car has had all dealer recommended maintenance and service for miles driven. It runs quiet and smooth, the seats are leather and look great with no tears, splits or really noticeable wear. The back floor mats and front passenger mat still look new, however the driver's mat shows wear. Overall the exterior paint still looks great but there is some clear coat around the front bumper panel that has peeled due to long time plant irrigation hitting it during the nights while outside. The cost to manually repair that section/panel would probably be close to the cost of a new painted panel. There are a few small dings here and there that are barely noticeable. What I love most about my Honda is its reliability. I never have to worry when I start it or take it on a very long trip, will I get to my destination? I know it will. I also love its roomy interior for all sizes of passengers and loads upon loads of heavy cargo. Its truck chassis means smooth sailing over bumpy roads. It has a great music system, 6-cd changer and a built in large GPS. I plan to drive my Honda at least another hundred thousand miles and then buy another one. City driving our 4 wheel driving this compact little 8 seater really has it all. 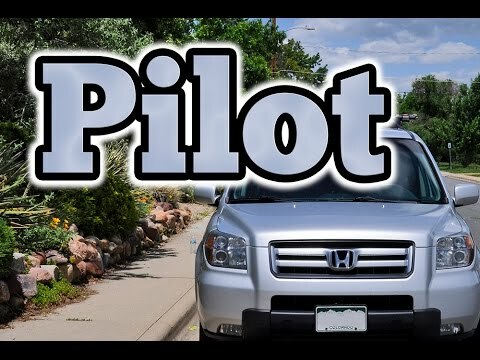 I actually really love the hunt pilot I have 6 children between the ages of 17 and 4 years old with my 15 year old son being seven foot one and we all can fit into the pilot. It is a 8 seater it is very roomy wide why's everybody seems have nice leg room a course we put the smaller kids on the for this back. It has a lot of pick up and go you can definitely jump out into traffic and get going. The only thing I do not like about my particular of pilot as its gas mileage it probably gets about 17 miles to the gallon in town and for me and as much driving his ideal I would really like to get a hybrid they gets like 27 gallons the mile. But the pilot you feel very secure and it handles very well and it is a nice smooth ride. The best part about the car is the space. It has enough room to to hold 7 people comfortably and when the back seats are down it has a very spacious trunk. I have moved a couple times and can fit many boxes and item when putting all the seats down. The radio is very nice because it has XM music but it doesn't have an easily accessible aux cord. The car has leather seats which keeps the car cold in winter but become very hot when left in hot weather. The AC works very well but if left in idle the AC stop and it blows lukewarm air which may be uncomfortable for some people. Lastly the car handles well but the brakes are very sensitive. Overall the car has done well for the 12 years my family and I have had it. 2006 Honda Pilot EX-L 4X4 SUV Overview and walk around review.